Me and my fellow Yin Yoga teachers Clarice, Cookie and Dona celebrating our blessings: our periods! Photo taken from Yin Yoga Philippines during our Yin Yoga for Women’s Health training. Yesterday an article made it’s rounds on my Facebook feed. I initially dismissed it as I felt I already knew what to do, given my long history of having lived with and made efforts to manage my condition. However, my friend Dona, who is a staunch Women’s Health and Menstrual Health advocate, shared the article and asked my opinion and so I decided to read it. For those unfamiliar with PCOS, or Polycystic Ovary Syndrome, here’s a quick rundown: PCOS is a common hormonal disorders in women that reportedly affects one in every five women. Women with this disorder can experience a wide array of symptoms, including irregular periods, hirsutism or excessive facial and body hair growth, polycystic ovaries, and infertility. I was diagnosed with PCOS when I was 21. It was also noted that I had endometrial hyperplasia. Initial treatments included an outpatient D&C, hormone treatments that ranged from oral contraceptives to injections, and a major diet upheaval. After my first D&C, I had another bout of Dysfunctional Uterine Bleeding (DUB) and went through more treatments to balance my hormones. I was even prescribed weight loss pills to get the ball rolling. Going back to the article, Dona noted that there are many other natural methods to treat PCOS without going the birth control and progesterone route. I responded that as someone who went the birth control and progesterone treatments route, I can say it did address the obvious symptoms in the beginning, but it did not completely address the reason why I was having the symptoms in the first place. I was even prescribed metformin above the pills, injections and procedures. While I was on hormonal treatments I did lose a boatload of weight: a whopping 80 pounds in about 10 months. But that lead to a crashed immune system, terrible GERD (to the point that I would even throw up water) and hair loss. So is it a need to do? Maybe the better term for it is “can help”. My cycle was regular, but my body was shot. What we need to do is yin yoga. Seriously. It was only my regular yin practice that addressed the problem holistically. Other forms of yoga are also supportive, but without the yin, its not enough. At least in my opinion. I wrote about this more extensively in a previous article here in my blog which was entitled Yoga for Better Menstrual Health. Just as an added testimonial, I will acknowledge and admit that I have lessened on my yin practice because I have been teaching a lot and because I have less time to practice, when I do I want to sweat things out and move so I do a yang practice (whether yoga, pilates or brisk walking with my dogs). As a result, my cycle gets erratic and when I have my period, I get crampy, have migraines and my flow is dark and clotted. When I catch myself and make an effort to show up for my yin and meditation practices, things change. The second important change we need to make is towards our sleep. We live in such a yang world nowadays and we barely have enough opportunity to rest and embody a yin state. As a result, we are expending all our energies and internal fire to the point that we do not have the capacity to consolidate and gather our energies as needed. This contributes to difficulties in pregnancies and healthy menstrual health, as well as digestion. According to my teachers, there are three important factors that lead to good menstrual (and overall) health: good digestion, adequate sleep, and proper detoxification. It is important that we are in deep sleep or REM sleep by 11pm (that’s already actually late, but at the latest) till 2am in order for our bodies to be fully nourished and rested. Problems with the menstrual cycle can also indicate blockages or imbalances in the liver and gallbladder meridian channels of the body, and so good sleep at night can help start to balance things out. It sounds weird and unrelated, but it’s true. I’ll try to write a better article on Traditional Chinese Medicine and your period soon, at least a soon as it consolidates for me more. I have been medication free for the past three and a half years. I still struggle from time to time with the effects of PCOS, but I know why it is happening. With conscious awareness, I am able to help my body heal. If you are struggling like me, please feel free to reach out to me at ria@yogaplus.ph and together we can try to find ways to manage PCOS better. You can also join me on the mat for some Yin Yoga on Tuesdays at 9am or Wednesdays at 7am at Yoga+Makati. 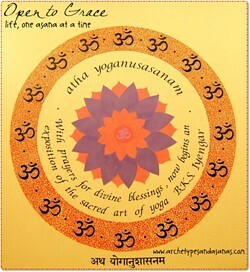 I also teach Yin Yoga on Monday evenings, 8pm, at Yoga+express DLSU. If you can’t make it at those times, all branches of Yoga+ offers yin classes throughout the week and at different times of day. Check out www.yogaplus.ph for the schedule. © 2019 Open to Grace. All rights reserved.